Winters' Day In: The Missing Link? The boys had been playing dress-up while I had my shower this morning. Tomorrow night at AWANA (kids club) it's dress-up night, so they were trying to decide what to be. 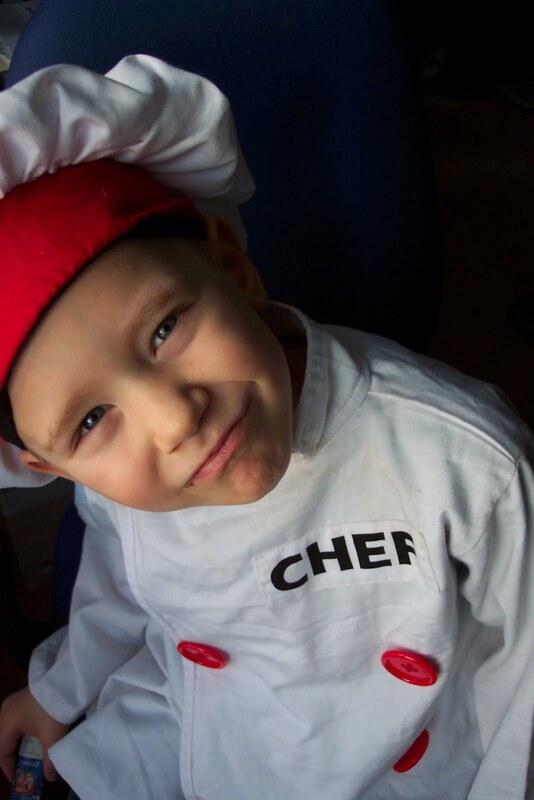 While I was applying my mascara with the bathroom door open (so the mirror would clear), Noah wandered in donned in the chef costume. He strained to see in the mirror, but it was a little above his line of sight to get a good view, so he started clambering up on the counter--all the while yammering on. "Mom, I is a cookin' chef for AWANA because I cimb up here to see because I yook in the mirror..."
"No, I just climb," he replied matter-of-factly, and indeed, he was already sitting atop the vanity, perched at the edge of the sink. He admired his ensemble in the mirror, not even glancing in my direction. "... because you're a monkey?" I smiled, knowing the humour would be totally lost on him. "No, my feet are a boy." "Just your feet? The rest of you is a monkey?" Yep! I was pretty happy with the way the photo turned out, too... I think I may have found the "sweet spot" for photographing in this house! Yay!